As we discussed on Episode 91 of The Frank Truth Sinatra Podcast, Warner Home Video released 5 new collections of 22 Sinatra films on DVD on May 13th. Thanks to generous donations from listeners Tom and Doug, I'm beginning to work my way through each of these sets for review on the program. 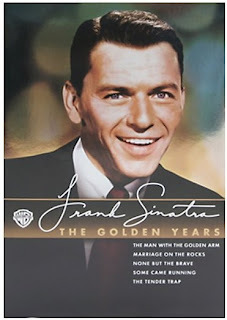 The first collection I ordered was Frank Sinatra: The Golden Years. It includes Sinatra’s Oscar® nominated performance in The Man with the Golden Arm, along with None but the Brave, Some Came Running, The Tender Trap and Marriage on the Rocks. I plan to devote an episode to each movie in the coming months. A couple of these Sinatra pictures are ones that I haven't seen, so I'm especially anxious to view them - in particular None but the Brave, Sinatra's only directorial outing. If you have thoughts about any of these films, I'd love to present them on the show. Please send an email, call our listener comment line at +1-312-235-2139 or leave comments here on the Weblog. Thanks to David Julian Gray who loaned me his copy, I'm nearly finished with When Frankie Went To Hollywood. Although I'm finding it a bit of a difficult read, it does present some interesting ideas and perspective on Sinatra's screen personae over the years, and I hope it will help to inform some of our discussion as we enjoy these films together. If you're interested in purchasing this set or other Sinatra videos, please consider shopping through our Amazon pages to help support the show. Thanks!